Proposed Light Rail Stations in Trenton Trenton sees itself as a destination for the SNJLRT. The original plan calls for the northern terminus to be at the Northeast Corridor Station. From that station, buses fan out across the city. Trenton City and Mercer County officials believe that ridership will increase if the train takes people closer to their destination. Station stops have been proposed for an extension from the NEC station to the State House. 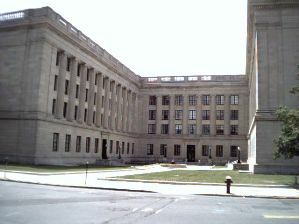 This extension will serve the office/commercial sector of Trenton, including the new hotel and convention center. A "tail track" will extend further west on West State Street to accommodate waiting trains. The Trenton Commons stop. 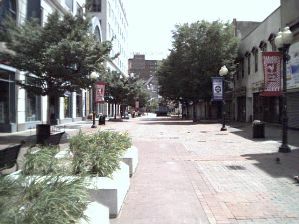 The Commons is a pedestrain mall. Now closed to vehicular traffic, a separate proposal has been made to reopen this section to traffic. This would likely occur in concert with light rail construction. 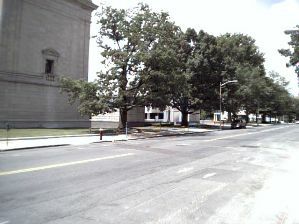 The Federal Courthouse on East State Street is also a proposed stop. 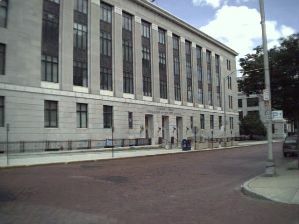 This stop would also serve the State Department of Environmental Protection. If the extension is completed, the new track would cross the existing track here at State Street. 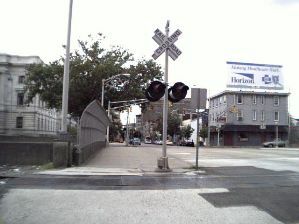 In earlier years, this intersection included double track for the railroad, a bridge over the Delaware and Raritan Canal, and double trolley tracks. The Route 1 Freeway now runs where the canal did, and the bridge over the Freeway is fixed. A draw bridge carried the trolleys and vehicular traffic over the Canal. This grade crossing has seen more freight activity since the construction of the light rail has taken out the Rancocas Bridge and track in various areas. Trains from the Morrisville Yard are switched to this track to serve destinations in Bordentown and Burlington. 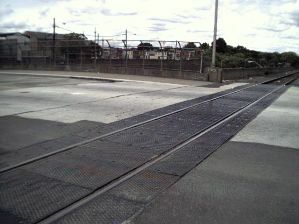 Once all construction is complete, freight traffic will once again be infrequent at this crossing.